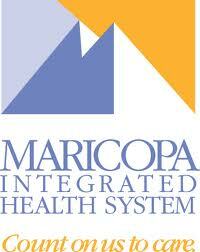 Maricopa Integrated Health System (MIHS) has an excellent reputation as a quality institute that does clinical research to improve health care outcomes. MIHS serves a diverse patient population in central Phoenix, including those who are uninsured. Physicians in MIHS participate in clinical trials; evidence-based medicine reviews of patient treatment, diagnosis, and care; and collaborative research projects with research partnerships and alliances with major institutions that support the academic mission of MIHS.